Here's a triple whammy. The reverse of the pre-paid postcard has the latest in bird stamps, head of the magnificent Wedge-tailed eagle cancelled with a tiger on the FDI 28-09-2012, at Parkville Zoo, Melbourne. This is only the second time the Wedgie has featured on an Australian stamp. 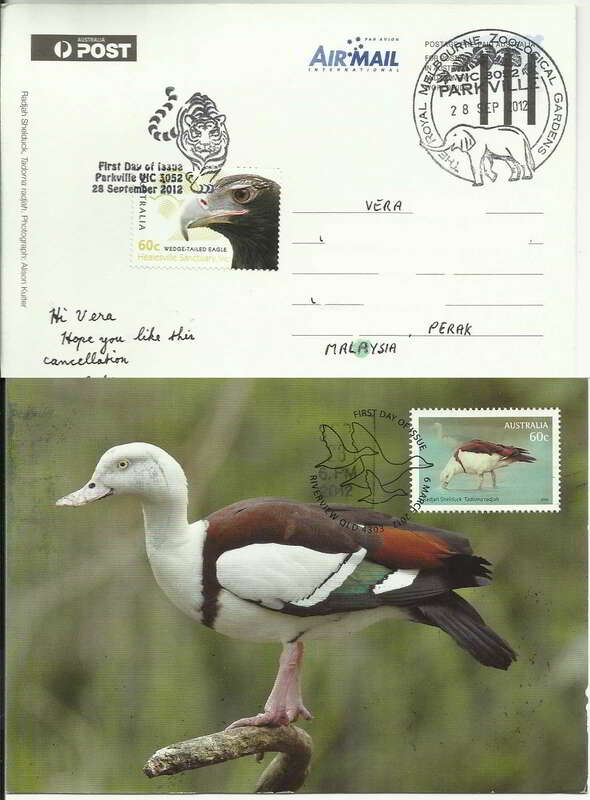 Front of the card is my favorite duck, the handsome Rajah Shelduck on a maxi-card . Always nice to see the Parkville Zoo permanent marker with the elephant . Thanks again to my good friend Robin in Victoria .